The days are getting shorter and the fourth quarter is now underway. As you review your year-end budgets, you may be pleasantly surprised to find you have some unspent funds. This could be a result of careful and conservative planning and budgeting early in the year, leaving you with an unexpected surplus at year’s end. While this is a good scenario, it’s important to know all of your options when planning where those extra dollars would be best allocated. Rolling those extra funds into next year’s budget might appear that you are over-budgeted and open the door for lower budget levels in future years. 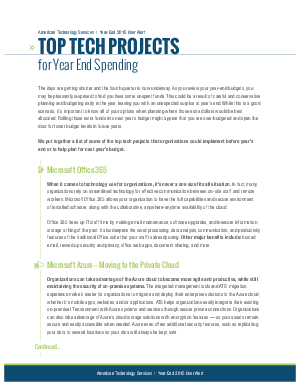 Download this guide and learn the top tech projects that organizations could implement before year’s end or to help plan for next year’s budget.